If you're looking for a hot hatch at bargain prices, stop at the Focus ST. It's less expensive, better balanced and more tolerable on a daily basis than the outrageous RS. The 2017 Ford Focus has great road manners and scorching high-performance editions, but it's compromised by a small back seat. Fuel-saving skinflints, daily commuters, tire-shredders with the budget for an insurance payment as high as their car note—the Ford Focus has something for all those drivers. A family of sedans and hatchbacks, the Focus lineup offers up a huge range of personalities that change with every powertrain choice, with its body styles, and with its trim packages. It's extremely versatile at the order sheet—less so when you lock down on one of its more esoteric versions. From price-focused S and SE models, to plusher SEL and Titanium versions, on to sportier ST and RS models, the Focus makes choice more than a talking point. No matter which you pick, the Focus antes in smart handling and good fuel economy. There's even a Focus Electric, which we cover separately, if you're looking ahead to a new generation of cars. The Focus is fresh off a light restyle in the 2015 model year, meant to keep it looking sleek until a 2018 redo. The new front end fits nicely with the existing profile; it's a calming hand applied to a design that's been seen by some as a bit too swoopy. Inside, the Focus remains on the overstyled side, but the vertically-oriented vents and pleasant surface sculpting give it a look and feel that's original and complex—a definite plus in a crowded class of look-alikes. That said, there's a lot of plastic inside, and the design cuts into usable space. Most of the Focus lineup is powered by a 160-horsepower, 2.0-liter direct-injected 4-cylinder engine. 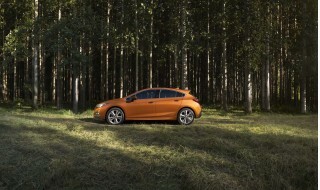 It provides plenty of pep for the Focus, whether fitted with the 5-speed manual or 6-speed dual-clutch automatic. A turbocharged inline-3 displacing just 1.0 liters is the slowest, leanest model available, unless you opt for the plug-in Focus Electric. It comes with either a 6-speed automatic or manual. Those who appreciate lean performance will appreciate the SE Sport Package, bringing a touring suspension, 17-inch black gloss aluminum wheels, H-rated tires, and paddle shifters for automatic versions. Step up to the high-performance Focus ST, with its 2.0-liter turbocharged inline-4, making 252 hp, and you can get to 60 mph in just 6.3 seconds and to a top speed of 155 mph. That model is paired exclusively to a 6-speed manual. The Focus RS gets a 2.3-liter turbo-4 and 350 hp, along with torque-vectoring all-wheel drive, and a loopy sense of fun generated by driver-selectable Track and Drift modes. Like the Mazda 3 and VW Golf, the Focus has better handling than many cars in its class. Its electric steering is well-weighted, and its firm suspension doesn't crash over large bumps. On the performance front, we'd opt for the sweet ST over the slightly nuts RS. The former's a real-world performance option; the latter, a drift-happy track toy with confining seats, lots of torque steer, and handling that rewards late decisions and lots of exaggerated throttle. The Focus' interior no longer looks as sleek as it once did, now that the Honda Civic has redrawn the map for small-car interiors. The Focus has lots of plastic, most of it okay, but the design eats up interior space and makes it feel more cramped than it is. In front, there's just enough leg room and head room to fit even those over 6 feet, but head and leg room are skimpy in back. The Focus family provides impressive safety credentials—and that holds true whether you're weighing these compact sedans and hatchbacks up against others in the class, or versus smaller luxury models. There are available blind-spot monitors as well as lane-keeping as options, although you do need to ante up to one of the higher trim models to get them. The Focus lineup lacks any top-tech forward-collision systems or automatic-braking technologies, which keeps it out of the running for the IIHS Top Safety Pick+ honor list. A rearview camera is standard. The Focus lineup includes models that meet needs from rather basic commuting, with base Focus S models, all the way up to top Titanium trims, which have navigation, Active Park Assist, and other extras and effectively play the role of premium sedan without a premium price tag. Ford's latest Sync 3 infotainment system almost makes us forget the regrettable MyFord Touch setup. Sync 3 has a fully capacitive screen with pinching and swiping capability, a streamlined menu structure, smart-charging USB ports, and AppLink capability for on-screen operation of various smartphone apps. The 2017 Ford Focus remains one of the most extroverted compact-car designs on the market. You know the no-frills small-car image? The 2017 Ford Focus, in its current generation, now going on its sixth year (or seventh model year), has always eschewed that. The Focus looks and feels far more upscale than most compacts, and you won't find a true stripped-down base model here. In four-door sedan or five-door hatchback form, it looks great—although in Titanium trim, a set of coordinated details push the design to its best. Back in 2015, the Focus received a minor makeover, with a new front and and some upgraded interior materials. Change has otherwise been kept to a minimum since the Focus was new in 2012, and that's fine. 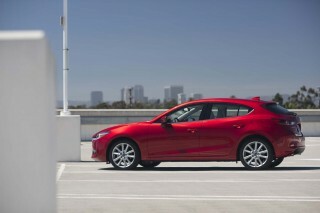 It's a handsome car, more so in hatchback than in sedan form. The combination of creases and curves contrasts well with the smooth front-end design. The rising window line gives the look its drama, and though the Focus' huge taillights may seem a bit odd at first, they nicely frame its corners. The high-performance ST variant, and the even higher-performance RS, stand out in their restraint. They each get a somewhat lower stance, bigger wheels, and different lower bodywork, with deeply bolstered Recaro sport seats and some color-matched stitched accents inside. There's also a plethora of logos, so many we hope they're not charging by the pound. The Focus' cabin is on the overstyled side. It's original but complex: the vertically oriented vents and surface sculpting take up more than their share of interior space that stands out in a crowded class of look-alike small cars. And yet, there's nothing intensely "small car" about the Focus. There's a nicely tailored look to the entire interior that extends to door trim and even seats—especially in those top Titanium models. Up close, the revamped materials, with new satin chrome trims and seat upholsteries, bring it all together. The Focus ST and RS have amazing hot-hatch tricks up their sleeve, but all Focuses can be fun to drive. The Ford Focus includes a wide range of vehicles that have some dramatic differences under the hood, in terms of acceleration and performance; yet across the model line, the Focus remains the pick versus other comparable models if it's crisp steering response and agile handling that you value. For most of the model line—in the Focus models that you're most likely to see at the dealership—there's a 2.0-liter, naturally aspirated inline-4 under the hood. 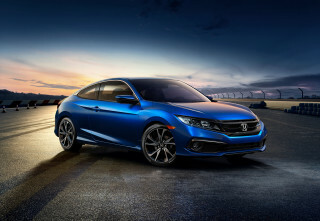 With direct injection and variable valve timing, it makes 160 horsepower and 146 pound-feet of torque, and it's paired with either a 5-speed manual or 6-speed PowerShift dual-clutch automatic. That engine provides plenty of pep for the Focus, regardless of transmission choice. The automatic isn't smooth-shifting at low speeds, but it does a good job keeping the revs up when you need them. We still haven't driven the 1.0-liter, 3-cylinder engine in the Focus SFE, though we've sampled it in the even smaller Fiesta. This engine makes 123 hp, as well as an impressive 148 lb-ft of torque at just 1,400 rpm. Paired with a 6-speed automatic or a 6-speed manual, it puts its best foot forward in gas mileage. Throughout most of its lineup, the Focus is one of the better-handling cars to begin with. Ford's electric power steering system provides nice weighting and it performs well, providing precise control but not transmitting much feel of the road. The suspension is quite firm, yet it doesn't crash over some of the harsher stuff. Ride comfort is impressive, even though the Focus is one of the firmer-riding small cars, its more sophisticated suspension tuning filters out the most jarring bumps. About the only disappointment here is that low-end Focus S and SE still include sub-par rear drum brakes, while most rival models include four-wheel disc brakes. An SE Sport Package is available and brings the most driving fun for the money to the lineup, with a touring suspension, 17-inch black gloss aluminum wheels, H-rated tires, and paddle-shifters for PowerShift automatic versions. If you really want to get the most out of the handling and capability in the Focus, the ST and RS might be your thing. The ST comes with a 240-hp, 2.0-liter turbocharged inline-4 that allows the Focus to get to 60 mph in just 6.3 seconds, and to a top speed of 155 mph. There's no available automatic here—only a 6-speed manual. The Focus ST provides as much of a performance rush as you might guess; it doesn't disappoint. 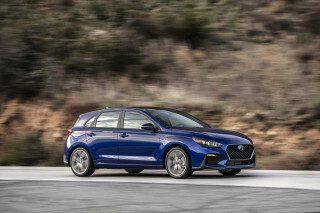 What's surprising, though, is how well the car is engineered and integrated; there's none of the twitchy tuner-car attitude that can affect the Mazdaspeed3 and Mitsubishi Evolution, and Subaru WRX STI, for instance. 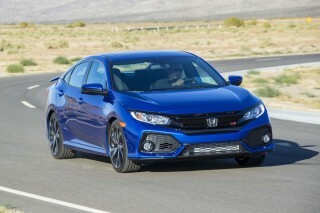 With steering and suspension different than in other Focus models—there's a quick, variable-ratio steering rack, a suspension lowered by 10 mm, and a rear suspension that moves its mounting points outward—this is a model that feels like a performance car, beyond what's under the hood. We prefer it, in fact, to the borderline crazy Focus RS. Its 2.3-liter turbo-4 makes 350 hp. It puts it all to the ground via a full-time all-wheel drive system with dynamic torque vectoring and a special 6-speed manual transmission. A driver-selectable sport suspension, Track and Drift driving modes, upgraded brakes, and a sport exhaust, as well as plenty more performance upgrades, the Focus RS is stiff and unyielding on public roads, quick to cut into turns, but a handful to manage thanks to still-present torque steer. It's the ultimate track play toy if sliding through a set of tires is your idea of fun; for most drivers, the Focus ST is a much more amenable daily driver. Good front seats work for Focus drivers, but the back seat is skimpy. Compact cars don't often fare as well in our ratings for comfort and utility. They're small for a reason, and their back seats are often too tight for even medium-sized adults. That's the case with the Focus. Its interior is fine for adults in front, but in back it skimps on space. Hatchbacks offer some versatility, but the Focus' interior is getting rather dated, too. In front, the Focus suits us fairly well. The heavily sculpted instrument panel can detract from usefulness and front-seat space. The seats themselves, even in base models, are fairly supportive. Get the upgraded sport seats of the Titanium model, and you'll get good thigh and back support for long trips, plus a little more lateral support and a plusher look. The top-tier Recaro seats in the Focus ST and RS won't be for everyone. They're very snug, and their design won't work with all torso heights. Whether you choose the sedan or hatchback, you get back seat accommodations that are virtually the same: tight. It's not easy to get in the back seat, due to the small door cuts, and head and knee room are at a premium. If you want a little more flexibility, go with the hatchback. 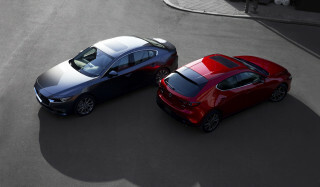 Technically the cargo space between the two models is the same, but the hatchback's space is far more usable. Seat-folding is a bit more involved than in other compact cars—you can't release the seat backs from the cargo area, and the headrests do get in the way. The exception is road noise; it's pretty typical for this class, and coarser road surfaces tend to ring into the cabin. The Focus does well in NHTSA testing, but lacks the same IIHS scorecard. The Focus scored well in safety tests when it was new in 2012, but those tests have changed, and its ratings are no longer best-in-class. The NHTSA says the Focus merits five-star overall safety ratings, as well as top five-star scores for frontal and side crash categories. The IIHS also gives it "Good" scores for most of its tests, but the Focus only rates an "Acceptable" in the agency's small-overlap test, which disqualifies it from Top Safety Pick contention. Electronic stability control, with a torque-vectoring system, is standard across the model line, as are front, side, and curtain bags. Ford has added available blind-spot monitors as well as lane-keeping as options, although you do need to ante up to one of the higher trim models to get them. There's also a lack of top-tech forward-collision systems or automatic-braking technologies available in the Focus. Outward vision in the Focus is quite good compared to that in other compact cars, although rearward vision can be tough in some instances. However a rearview camera is standard, and it's now included whether you have the smaller 4.2-inch info screen or the full-fledged Sync 3 infotainment system. The base Focus is inexpensive, but lightly equipped; Titanium versions break the economy-car bank. The Ford Focus has range—not electric range, but range in the Broadway sense. It's a cheap stripper in S guise, a rorty rally car in RS trim. Prices start from the high teens, and it's easy to crank the Focus RS well past $40,000. Focus sedans come in S, SE, SEL, and Titanium trim. 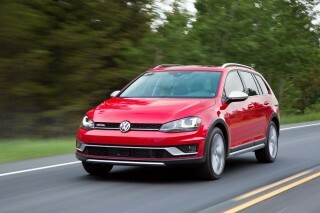 Hatchbacks are offered in SE, SEL, Titanium, ST, and RS trim. The Focus S and SE give bargain hunters the best value for their money. All versions get standard air conditioning, AM/FM/CD sound, Bluetooth audio streaming, 15-inch wheels, a rearview camera, power windows/locks/mirrors, steering-wheel audio controls, and a tilt/telescopic steering wheel. Remote start is an option. 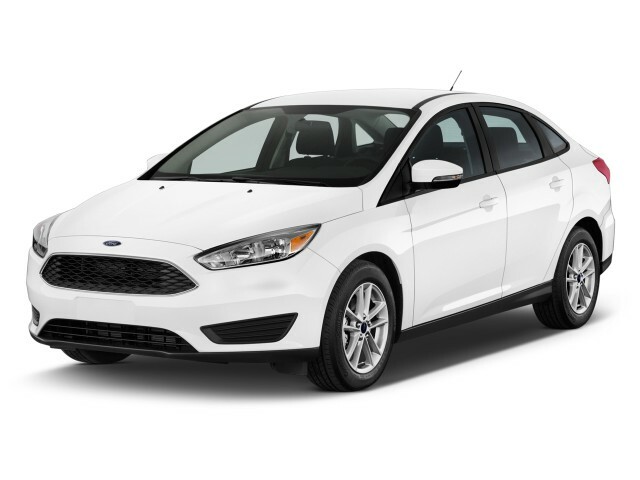 Focus SE models add larger 16-inch wheels, cruise control, fog lamps, and Ford's MyKey system. Options include leather, a power driver seat, rear disc brakes, rear parking sensors, a sport package, a moonroof, navigation, heated seats, satellite radio, and Sony audio. Focus SEL models get 17-inch wheels, rear disc brakes, a moonroof, ambient lighting, rear parking sensors, and Sync 3. The Focus Titanium tops it all off with dual-zone climate control, leather, Sony audio, HD and satellite radio, a sport suspension, sport seats, and summer performance tires on sport wheels. Options include automatic parking assistance--the Focus can park itself, using cameras and electric power steering--and navigation. At that trim level, it approaches Benz CLA and Audi A3 prices. Performance ST and RS models include specific powertrain and suspension upgrades, along with styling kits and 18-inch or 19-inch wheels. Options include navigation, Recaro seats, and a carbon-fiber accent package. Last year, Ford swapped in its much-improved Sync 3 infotainment system. Completely replacing the MyFord Touch touchscreen systems, Sync 3 brings a fully capacitive screen with pinching and swiping capability, a streamlined menu structure, smart-charging USB ports, and AppLink capability for on-screen operation of various smartphone apps. While Sync 3 is much slicker than the MyFord Touch system its replacing, we found that it's not without its faults. In various Titanium and Focus RS hatchbacks we've driven, the system had issues switching between day- and night-time modes on the touchscreen, and there was a slight lag in button presses. It's still a vast improvement over the glitchy predecessor. The Focus spans a huge range of fuel-economy options; you can guess which ones aren't so good. Ford lets Focus drivers choose from an especially wide range of engines, those with an eye on fuel economy—and those with gut-wrenching acceleration on tap. It's complicated somewhat by the lack of updated EPA ratings. So far, the agency only has rated the hyper-performance Focus RS under its slightly tougher 2017 standards. On that scale, the Focus RS is rated at 19 mpg city, 25 highway, and 22 combined. According to last year's numbers, the Ford Focus ST—which doesn't require premium fuel, like most other performance cars—earns 22/31/25 mpg from its 252-hp turbocharged engine. If you're able to control your right foot and keep the revs down, that is. The Focus most widely available was rated at a competitive 27/30/31 mpg, for its 2.0-liter inline-4 and 6-speed dual-clutch automatic. With the manual gearbox, the ratings were a bit lower—perhaps because the 5-speed keeps revs a bit higher on the highway. The most efficient gas model runs the numbers sky-high. 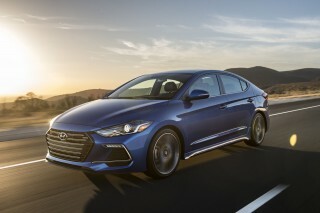 With the 1.0-liter 3-cylinder engine, EPA ratings for 2016 were 28/40/32 mpg with the 6-speed automatic, or 30/42/35 mpg with the 6-speed manual. Keep in mind that there's also the Focus Electric, a limited-availability, all-electric version of the Focus that's the best bet for short-distance commuters and achieves the best efficiency rating of anything in the lineup: an EPA-rated 105 MPGe (miles per gallon equivalent). Looking for a different year of the Ford Focus?